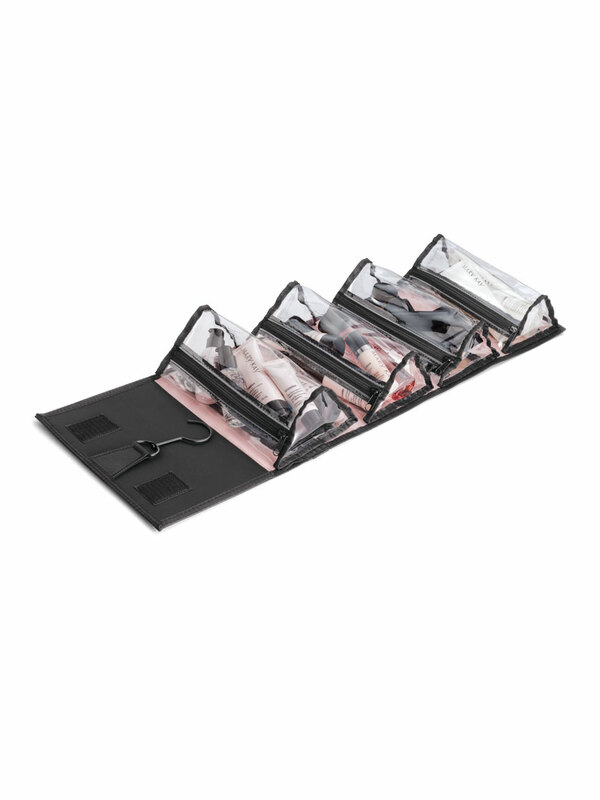 This all-in-one must-have organizer is ideal for storing your Mary Kay® cosmetics, skin care products and accessories whether you’re at home or on the road. Stylish bag features a black nylon exterior with the Mary Kay® logo, pink interior and black swivel hook for easy hanging. Inside, there are four clear, removable plastic zippered compartments to keep beauty supplies organized. Simple velcro close and nylon carrying handle make for easy portability. *Images show the bag filled with Mary Kay® products, but please note that the Travel Roll-Up Bag is sold as UNFILLED. Keep your favorite Mary Kay® beauty and skin care products stylishly at your fingertips wherever you are, wherever you go. Clear, removable plastic zippered compartments help keep beauty and skin care organized. Swivel hanger allows you to hang the bag vertically open for easy accessibility whether at home or while traveling.